Posted on 20/09/2012 by U.N. The Hoesch AG based in Dortmund once gave work to 64000 men and women, controlling dozens of subsidiaries. Few members of this steel empire have survived. One of them is the Hoesch Schwerter Profile GmbH. 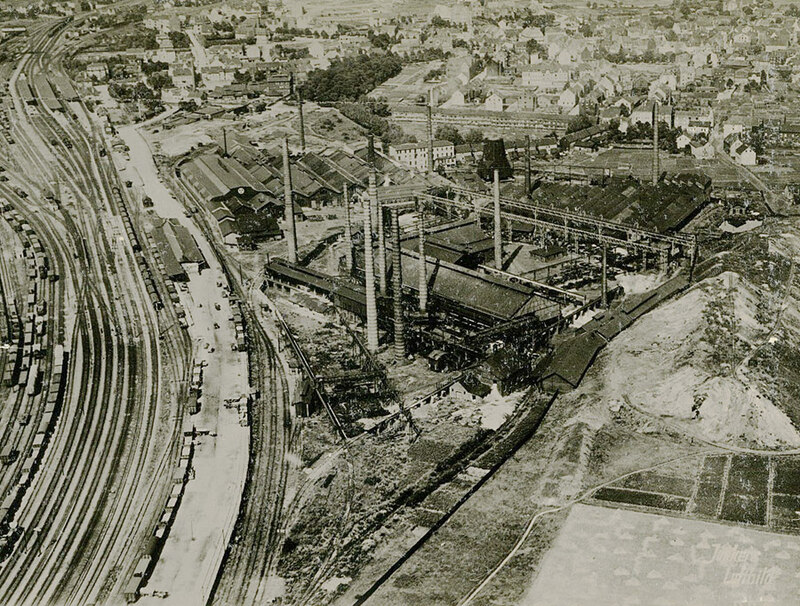 The steel mill in Schwerte, Germany was founded by the Kissing & Schmöle company from nearby Menden in 1868 next to the brand new railroad line going from Hagen to Unna. A melt shop and 5 rolling mills were built. The Johanneshütte near Siegen, running two blast furnaces, was acquired in 1871 and supplied iron until 1914. In 1891 the mill was expanded by an open hearth shop, a blooming mill and a wire mill. In 1926 the steel plant became part of the Vereinigte Stahlwerke AG and was renamed Schwerter Profileisenwalzwerke AG in 1936. After the war Schwerte became part of the Dortmund-Hörder Hüttenunion (DHHU). The stamping mill was built in 1957 and from 1962 the new rolling mill no.7 replaced all older mills. 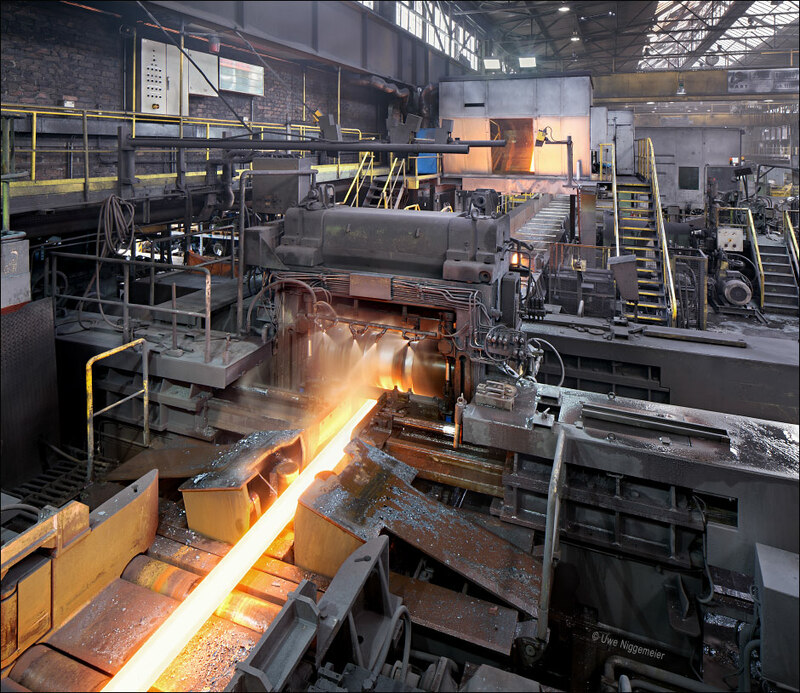 After the fusion of DHHU and Hoesch in 1966 Schwerte joined the Hoesch rolling mills in Hohenlimburg to form the Hoesch Werke Hohenlimburg Schwerte AG. The takeover of Hoesch by Krupp in 1992 made the works part of Friedrich Krupp AG Hoesch-Krupp, and in 1999 of the ThyssenKrupp AG. In 2005 the Calvi holding from Italy purchased the Schwerte plant, now called Hoesch Schwerter Profile GmbH, producing 70000 tons of special profiles per year and employing a staff of 530. This entry was posted in Gallery, Historical, Works and tagged Germany, Hoesch, Rolling Mill, Schwerte by U.N.. Bookmark the permalink. what a nice small rolling mill. 14-24mm?